Please feel free to email us at anytime. Feedback and suggestions are always welcome. Accounting Office The Accounting Office is located in Bancroft Hall 5B15. We serve midshipmen and NABSD Staff. The normal business hours are M-F 7:30 a.m. – 3:30 p.m.
Barber Shop The Barber Shop is located in the first wing of Bancroft Hall. Midshipmen can walk in for a haircut or schedule an appointment on the barber/beauty shop scheduler found under MISLO. Active duty personnel may call 410-293-3200 for an appointment. Hours of Operation are Monday – Friday 7:30 a.m. – 3:30 p.m. The Barber Shop and Beauty Shop are closed during Spring Break and the Winter holiday break. Customers must be in the uniform of the day for service. Brigade Sports Complex The Brigade Sports Complex is located across the Severn River on Greenbury Point and is adjacent to the Naval Academy Golf Course. The Fitness Center and Tennis facility is available for use by Midshipmen, authorized patrons and their guests. Catering Naval Academy Catering is located on the second deck of the Naval Academy Club at 2 Truxtun Road. We provide full service catering within the Club, Alumni Hall or any other authorized venue on the yard. For inquiries call 410-293-2897 or 410-293-2899 or drop by our office Monday through Friday, 9:00 am – 5:00 pm. Cobbler Shop The Cobbler Shop repairs shoes for midshipmen, faculty, and staff. Additionally, the Cobbler Shop can repair leather goods. The Cobbler Shop is located in the 5th wing basement, and the hours of operation are Monday through Friday 7:30 a.m. – 4:00 p.m. The phone number is 410-293-3474. Drydock Restaurant The Drydock Restaurant is located in Dahlgren Hall. We are open to Midshipmen, faculty, staff and the public for dining on the yard. Please contact us if you are interested in having a catered event or group meal for your party; we cater the newly renovated Midshipmen Activities Center located in Dahlgren Hall. The Drydock Restaurant’s phone number is 410-293-2873. Please let us know about your experience in Drydock, we appreciate your feedback! Gift Shop The US Naval Academy Gift Shop is located inside the Armel-Leftwich Visitor Center next to Halsey field house. All Midshipmen, active & retired service members and USNA faculty and staff receive 10% discount with ID, and all sales are tax exempt. FedEx shipping is available for a nominal fee. We are open daily 9:00 a.m. – 5:00 p.m. March-December; 09:00 a.m. to 04:00 p.m. January-February. Laundry and Dry Cleaning The Naval Academy Laundry and Dry Cleaning Facility provides a full service program to the Brigade of Midshipmen and faculty and staff assigned to USNA. Additionally, the Laundry and Dry Cleaning Facility provides support to the Midshipmen Food Services Division, Brigade Medical, Naval Academy Club, and Barber/Beauty Shop. The Naval Academy Laundry and Dry Cleaning Facility is located at 580 Kingwood Street. The Bancroft Hall 5th Wing Laundry Service Center is located in the 5th wing near the entrance to King Hall. Hours of Operation are Monday – Friday, 7:30 a.m. – 4:00 p.m.
Midshipmen Computer Repair Center (MCRC) The Midshipmen Computer Repair Center (MCRC) is located in the basement of Bancroft Hall Room 4B05. Midshipmen can bring their USNA computers to the MCRC for USNA software and warranty repair service. Midshipmen Store The Midshipmen Store offers a wide variety of merchandise to support the Brigade of Midshipmen, including the world’s largest selection of U. S. Naval Academy, Navy, and Marine Corps emblematic clothing and gifts. Open to authorized patrons, the Brigade of Midshipmen and their parents/guardians, Lifetime Alumni Associations members, U.S. Naval Academy faculty and staff, and other groups as authorized. The Midshipmen Store is located in Bancroft Hall 1st and 3rd Wings. Normal business hours are M-F from 7:30 a.m. – 4:00 p.m. Main number 410-293-2392. Repair Tailor Shop The Repair Tailor Shop is located in Bancroft Hall, 5th Wing, Room 5B14. Full tailoring and monogramming services are available to the Brigade of Midshipmen, USN officers and enlisted, and USNA faculty and staff. Hours of operation are Monday-Friday 7:30 a.m. – 4:00 p.m. For information, please call 410-293-3758. Midshipmen must be in uniform of the day for service. Steerage Restaurant The Steerage Restaurant is located in Bancroft Hall, beneath the main rotunda. Steerage is open during the academic year from 7:00 p.m. – 11:00 p.m. Sunday through Thursday. Steerage is open to Midshipmen and other patrons approved by the Senior Bancroft Leadership. Steerage’s phone number is 410-293-2950. Textbook Issue Textbook Issue sells textbooks and other academic items that have been requested by the academic departments for the courses offered at USNA. Hours of operation are Monday through Friday 7:30 a.m. – 4:00 p.m. The phone number is 410-293-2904. Uniform Store The Uniform Store sells uniforms to midshipmen, alumni, officers and enlisted personnel assigned to USNA. The Uniform Store is located in Bancroft Hall 5th wing basement. Hours of operation are Monday through Friday 7:30 a.m. – 4:00 p.m. The phone number is 410-293-2906. Midshipmen must be in the uniform of the day for service. Visitor Center The Armel-Leftwich Visitor Center located just inside Gate 1. We are open March-December, 9:00 a.m. to 5:00 p.m.; January-February, 9:00 a.m. – 4:00 p.m.
YardCard The Yardcard (NABSD Cash Office) is located at 101 Wilson Road adjacent to the NFCU Lobby. 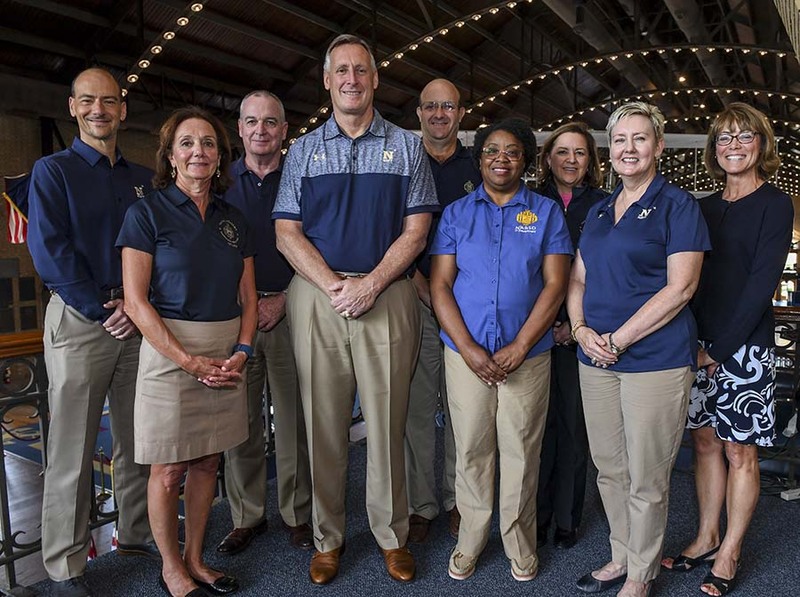 We serve Midshipmen, Parents, Faculty and Staff of USNA. Normal business hours are M-F from 7:30 a.m. – 2:45 p.m.